A webring is a way of linking a series of similar sites to make it easier to travel between them. Instead of a "Links Page" that the user has to keep clicking back to -- and that the site owner has to keep maintaining -- each site in the webring has a small block of standard code with links like "Next" and "Previous". The software at Webring.com keeps track of who is where in the ring. 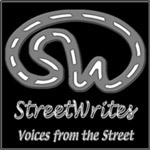 What Is the StreetWrites Webring? The StreetWrites webring links the major content pages of the StreetWrites website and the home pages of all of the workshop members who have websites, giving visitors a chance to browse our offerings in the easiest way available -- and making it easier for NetMama Anitra to do maintenance! If Anitra is maintaining a webpage for you, it's been added to the ring! This must be either the page you are going to put the navigation code on, or a page that clearly links to the location of your navigation code and has "webrings" in the text (or in the 'alt' text of a graphic link.) Otherwise, the ring cannot be navigated. This must also be either the page you have writing content on, or a page that clearly links to that content, and back again. This cannot be ALL CAPS. Please, don't say "My Home Page." Your title should be descriptive and unique, containing keywords you use in your content, all the good "Yes I want to be found in search engines" rules. This is what visitors to the ring will see in the list of member sites. Along with your site title, it is the only material used if a visitor does a Search of the content of the ring. Write a description that will attract traffic, without hype. Use keywords, yes, but write in sentences. If you are not currently a member of Webring, you must join before filling out the form. Membership is free. Webring does not spam you. And as a member, you can create or join any number of rings and manage them all from one center. You will be sent an email containing the code you need to install on your page to be an active part of the ring. This will initially display a link to the ring hub page with the message "Pending." If, after reviewing your site, I add it to the ring, this will change to display the full set of ring navigation code. If for any reason I deny your application, the link to the StreetWrites ring will simply disappear. If you have not installed the ring navigation code on your webpage before I add you to the ring, your page will remain in "suspended" status until you do. You will not be getting traffic from the ring until visitors can navigate through your page to the rest of the ring. Fair 'nuff? Click the link at the top for "My Rings"
Click the link in the left column for "View Ring Sites"
Your code will appear in a text box just below a sample of what your SSNB code should look like when installed. Copy the code and place it on your site. The current coding between those two tags provides a link to a page that will display all your navbars. If you want to display the navbars directly on the current page, you can use the HTML version of the navbar. To get the HTML navbar, follow the above steps, but when you get to the page displaying the SSNB code, scroll to the bottom and click the word "here" at the end of the sentence "Members who wish to use the HTML version of this nav bar should go here." You can find additional help at my Webring Management page. New to webrings and want more information? See My First Ring. The Webring magic cannot work without you. You are the only one who can keep your site information current. If you move your page, change your email address, or make other updates that affect navigation and communication in the ring, you are responsible for logging in to Webring and updating your information. Webring has been through three generations since the StreetWrites ring began: Webring.org, Yahoo Webring, and now Webring.com. You cannot edit your membership information or get new webring code unless you have an ID on the new system and have your webring membership associated with it. Signing up at Webring.com does not require telling them extensive personal detail, like signing up with Yahoo did, and they do not spam you. Begin creating your new Webring account at http://new.webring.com/cgi-bin/signup?start. The only personal information they need is an email account to reach you at and a birthdate to verify that you are over 18. Please enter a real email account that you check regularly, or this account is useless. You can make up a birthday, but make sure you make yourself over 18 or you won't be allowed to join this webring, or any other. Now go to http://new.webring.com/h?manage.html and enter the ring ID stwri and the site ID from the old ring code on your page. (Look for "id=x".) Try to remember your old password. If you don't remember it, guess and click "Associate Site" anyway -- it'll probably work. Now you can go to Your Ring Sites at http://N.webring.com/mbr?p=ms and you will see the name of your site right there beside StreetWrites! Click on your site title and you can edit your site information, if it needs updating. From that Edit screen, click on Get Navigation Code and you can get the pretty new navbar for the ring!